We all know and love Fiskars brand for their amazing scissors and cutting tools. They have been an icon in the crafting industry for 45 years now. Now, they have taken crafting to another level for scrapbookers and cardmakers with the Fuse Creativity system. As a crafter who does cardmaking, altered projects and scrapbooking, I was over the moon excited to get a chance to try out the Fuse and review it. I’m a sucker for gorgeous letterpress, but when I heard that this machine will die-cut and letter press all in one I just had to see it in action. When you get this system, it comes ready to go with a started set. You will receive the machine, a die and two letterpress plates, cutting plate with rubber mat, base plate, black ink pad and the owners manual. This will let you get to playing and creating immediately. I love that you can use your own ink pad choices and colors. It’s all about finding what you like best for the kind of project your creating. I was lucky enough to also receive the Adapter kit, two design sets and two expansion packs. What is all that you might ask? The design sets come with one die and two letterpress plates per pack. They are priced very well and can be stored directly in the machine itself. The expansion packs include four interchangeable letterpress plates that coordinate with the design sets. These are also priced to buy. Awesome right? The machine folds up nicely to be stored away, but I don’t see why you would want to do that. I tried all five techniques and found that it cuts like butter and works like a dream. No complaints from me at all. I love how quickly you can make fun tags, cards or layout embellishments with this in one step. I hope that you give this machine a new home in your studio. It will change the way you create for sure. Enter to win a Fuse Creativity System Prize Pack on AllFreeChristmasCrafts. Oh my this looks like an awesome craft addition to any craft room. I am just getting into scrap booking and not familiar with a lot of thing used yet but I got my grown daughter a cricut for Christmas and she did some sayings on shirts and that is all so far. 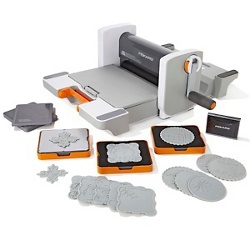 I have seen die cast machines before but did not know wether it was worth it but I see you can do a lot with it.I use the Fiskars scissors and I love them so this probably will be a good choice. Anyone use it? Would love to hear about it. Alwaysto to favecrafts review to find new things. OMG! This is at the very top of my wish list!!!! I would love to get one.